A long time ago, most monsters were charming, sweet-toothed individuals. Silly, hairy guys who lived happily in their monster world. They talked and played with kids, and would tell them bedtime stories. But one day, some monsters had a great big argument over a small sweet, and one beast got so angry that his furious cries would have frightened anyone. Among those who got the biggest fright were the most fearful of the letters, like L, T, and D. They ran far from that place. The monsters kept shouting, and other letters decided to get out of there. As more letters left, what the monsters were shouting became more difficult to understand. Finally, only a few brave letters remained in the world of the monsters; like G and R. This meant the monsters could no longer say anything other than things like "GRRR! !, "AAARRRGGHH!!" or "BOOOO!!". From then on, each time they went to visit some of their child friends, the monsters ended up frightening the children. As time passed, the idea spread that monsters are terrifying beings who only think of frightening us before eating us. One day, a girl was in monster world, looking for her ball. Hidden under some leaves, she found all the missing letters, who were living there, paralysed by fear. This worried the girl, and she decided to take the letters to her house to look after them. She was a very special girl, because she had managed to remain friends with one nice, intelligent, monster. This monster, seeing that nothing he tried to say came out right, pretended he couldn’t talk, so that he would never frighten anyone. He communicated with the girl using gestures. 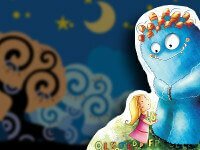 When, that night, this monster went to visit the girl, and saw the missing letters, he was so happy that he asked her if he could use the letters to talk. And, for the first time, the little girl heard her monster friend’s sweet voice. Together they set out to restore the voices of the other monsters, and they visited one after another, leaving letters with them, so the monsters could finally say nice words again. The grateful monsters gave the girl and her friend the best sweets they had in the house. Finally, it was time to go and visit the grumpy monster who had been at the centre of the original argument. He was old by now, but when he saw the letters, he jumped so abruptly that his old bones almost leapt out of his body. He looked at the frightened letters tenderly, and picked out the right ones to say "Sorry." He must have been waiting years for that moment, because immediately he warmly invited them all into his house. When they went in, they saw that all the preparations had been made for one enormous party, full of monsters, sweets and candy. Just exactly like people do these days on Halloween night. That has to be nothing more than a coincidence... right? The monster in the story decided to act as a mute monster to avoid scaring others. What do you think about that decision? Do you think it was an easy one for him?What would you be willing to do to enhance the life of others around you? Arguments between adults can get very loud, making children feel fear and anxiety. If your child have witnessed any of such arguments, now you can explain her that sometimes adults behave as monsters. Promise her you will try to avoid it.